Special Features:NEW! Ghostbusters Fan Commentary featuring Troy Benjamin and Chris Stewart (Interdimensional Crossrip podcast), Ashley Victoria Robinson (Geek History Lesson podcast) and Sean Bishop (Ghostbusters prop replica expert), moderated by Ghost Corps’ Eric ReichNEW! 6 Rare & Newly Unearthed Deleted Scenes, including the long-requested Fort Detmerring scenes! Also includes Raw Takes for the Central Park Bums sequenceNEW! 1984 ShoWest Exhibitor Reel, featuring Bill Murray and Dan Aykroyd pitching an early reel of footage to theatrical exhibitors!NEW! Full Ghostbusters TV Commercial from the filmNEW! Ghostbusters TV Commercial OuttakesNEW! “A Moment With the Stars” – Original EPK FeaturetteNEW! Original Ghostbusters Domestic Teaser TrailerNEW! Ghostbusters II Commentary featuring Director Ivan Reitman, Star/Co-Writer Dan Aykroyd and Executive Producer Joe MedjuckNEW! “The Oprah Winfrey Show: Cast of Ghostbusters II” – June 1989NEW! Full Ghostbusters II Theatrical EPKNEW! Rare Unfinished Teaser Trailer – featuring the full commercial from the film!NEW! 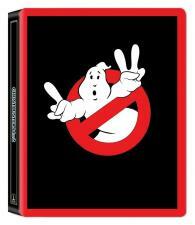 Original Stereo Audio for Both Films (Blu-ray only)"The Real Ghostbusters - Pitch Concept Pilot" - A Fan Restoration by Robert BarbieriGhostbusters Commentary featuring Ivan Reitman, Harold Ramis and Joe MedjuckSlimer Mode Picture-in-Picture TrackDeleted ScenesFeaturettesPhoto GalleriesTrailersAnd More!